Does Your Project Include a Change Implementation Plan? However, when dealing with change, there is often no repeatable framework or process for making certain the required strategies and tactics are applied. It's hit and miss. Providing a clear path for the future helps to make clarity out of the chaos that is so common in any change. Our Change Management Methodology, Accelerating Implementation Management (AIM), provides a systemic, systematic road map that can be the central cog of every Project Management Cycle. It is the project management approach for the “people-side” of implementation and can serveas a robust planning tool. 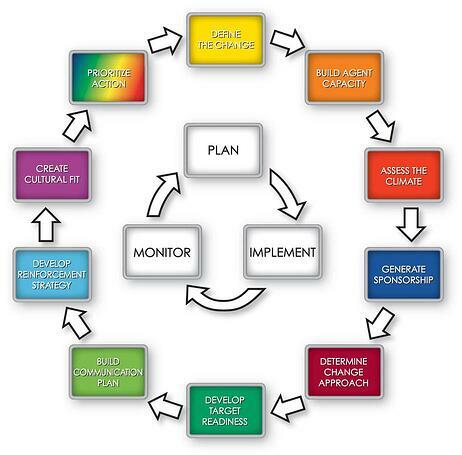 AIM consists of ten elements all of which surround the Project Management principles of Plan, Implement and Monitor. Although the Roadmap shows the steps occurring in a linear fashion, the reality of complex change is that steps are repeated, or may occur in a different sequence. The methodology is in essence a set of principles, tactics, and strategies that can be applied as needed. When building a Change Implementation Plan there are several key steps that must be addressed. At a minimum, an Implementation Plan must include a Business Case for Action (Defining the Change) as well as Sponsorship, Readiness, Reinforcement, and Communication strategies. Let’s take a look at each of these elements in a little bit more depth. Building a Business Case for Action is an imperative first step in any Implementation Plan. There are four questions that must be commonly understood by everyone involved in the change. What are we changing? Why are we changing? What are the consequences for not changing? And how will the progress be measured? As part of Defining the Change, we also have to identify the new behaviors that we are looking for as a result of this change. Sponsorship for change isn’t the responsibility of one individual. It is the responsibility of every individual who has direct reports that are impacted by the change. . Change is accelerated when what these leaders say, do, and reinforce and are all aligned and demonstrate commitment to the change. Every Change Implementation Plan should have an explicit strategy for ensuring this level of commitment at the beginning, middle, and end of of the project lifecycle. One of the mistakes organizations often make is waiting far too long to start to build readiness for a business change. Then building readiness becomes a reactive activity. Resistance is inevitable, and it’s a function of the level of work disruption—how many things are going to be different as a result of this change, and not whether a change is perceived to be positive or negative. It’s not logical, and it can’t be wished away. There are, however, pro-active steps organizations can take to identify the likely sources of resistance so that it can be better managed. 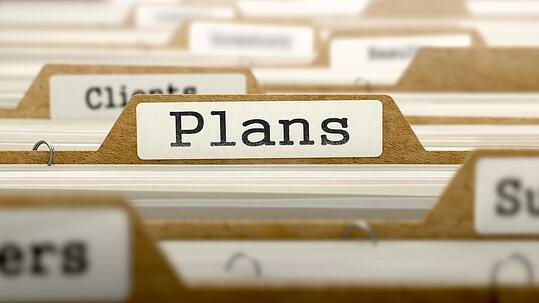 A communication plan is not the same thing as a complete implementation plan, it is just one piece of it. The AIM methodology centers communication efforts on delivering the right message to the right audience using the right communication vehicles, and always includes a feedback loop to gather reactions to both the content of the change, and how the change is being implemented. One of AIM’s core principles is that there is no behavior change unless you change the reinforcements. A best practice Implementation Plan must include a Reinforcement Strategy that aligns reinforcement mechanisms with the new performance expectations. Reinforcing‖ Sponsors must apply immediate rewards and/or negative consequences based on observable behavior of their direct reports. In today’s business world, it is more important than ever for an organization to extract maximum value from the initiatives and projects it elects to implement. It just makes sense to plan for the human side in the same way you plan for the technical side of your projects.